How are you getting around the guidelines for fan films? As CBS/Paramount has made clear, the guidelines are not laws; they are general parameters applied on a case-by-case basis. Since the implementation of the guidelines, we have stopped all crowdfunding activities and have focused strictly on completing the four episodes which had already been funded as of that time by fans' donations to our 501(c)(3) non-profit. 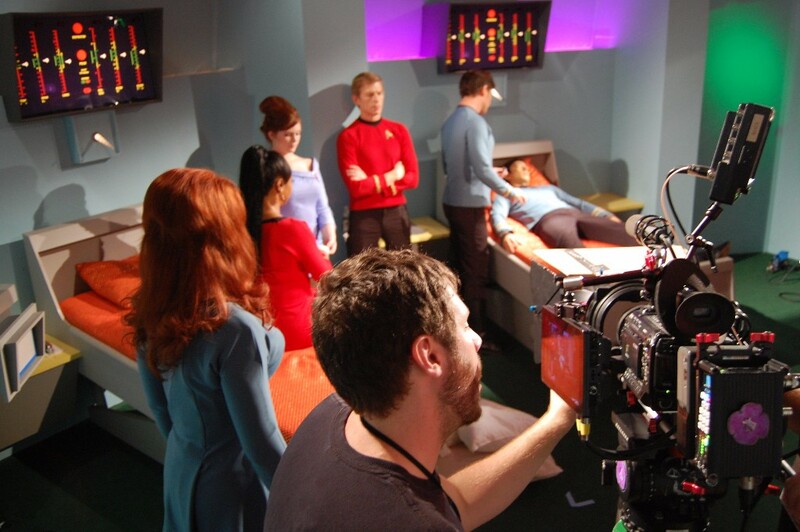 STAR TREK CONTINUES has always followed any and all instructions given to us by CBS regarding our production, and will continue to do so. Does STAR TREK CONTINUES have any type of special and/or official arrangement with CBS/Paramount? Why are you ending the series? CBS is not responsible for the decision to end the series. We are doing 11 episodes instead of 13 because another fan group took advantage of the good graces of the copyright holders forcing them to protect their property and the interests of their license holders. In deference and gratitude to CBS, we are wrapping up earlier than planned. We always have stood, and continue to stand, with CBS. 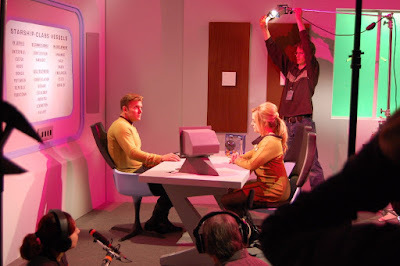 I just wish that CBS would be smart and pick up Star Trek Continues just as it is, put it on the air and on CBS All Access, with the current cast and continue Classic Trek in a way that overjoys the TOS fans. Will all the episodes that have been previously made still be up and able to be seen online? After you stop production?? I'm sorry to see the show come to an end. Just started watching TOS with my 8 year old daughter and looking forward to "continuing" on with your show. I look forward to your future projects! I am so going to miss this show. I would love to see you continue to do something, maybe post 5 year mission stuff? Since you have remained in the big C's good graces, perhaps you could move forward with their blessings. I JUST DONT WANT THIS TO END!!! This so 'REAL' Star Trek, and it takes me back to my childhood when Id sit and excitedly watch the reruns of the original. Please find a way to NOT STOP all together. And, thank you for keeping the dream of going to the unknown stars alive. You guys are AWESOME. Keep the sets!! When TPTB will change, you'll see another change in policy, letting fans do their thing once again,without any restrictions. I am convinced stat STC will return in a few years. I watch STAR TREK CONTINUES and feel like I'm seeing TOS for the first time when I was ten years old!!! I will be boycotting everything in the future that has StarTrek affixed to it as STC was the best and only show resembling what the original stood for. I wish all of the folks that were on the cast and production of STC all the best and thanks for the great memories. This has been a beautiful and wonderful ride, and a gift to all Trek Fans. Eleven episodes is more than we could ever have hoped for, and I for one thank each and every member of the STC Team for giving us such a rare and spectacular labor of love. I am so sad to see another wonderful Star Trek show come to an end. But I have totally enjoyed whatever STC gave us and for that I Thank You from the bottom of my Star Trek heart. Hope that somehow, in the future, we get to see them again and more of this program. Star Trek will live forever.......as least in my heart. Will we still be able to watch the episodes on this website? Or do you have to take it down? I'd like to see 26 episodes in all but it is a great run. Hoping STC can continue somehow. Agreed with the person who said they hope CBS would pick this very professional production up. So well done. Thank you to all who have contributed -- financially, lights, sets, grips, music, writing and acting. It's been a great ride! I cannot get enough. I would love to see this production as a television series. I grew up with TOS, have seen all the movies. This is above quality. All the actors, the storylines, the graphics...standing ovation to you all. Well done. I like the way they redid the outside scenes, given them more detail. Your first sentenence clears this up, the rules are only applied on a case by case basis, as such they only apply to axanar productions. Wouldn't it be wonderful if CBS could reach an agreement with a Netflix or Amazon to fund and broadcast this show, even if it simply for three or four episodes a year. I would certainly enjoy this, and feel that my subscription dollars would be well spent for the enjoyment I get from these STC. Certainly, everybody would win, as it's a proven "niche" product (sorry, it's the Marketing in me talking). There are some sites that offer DVD ISO files of other Star Trek fan productions. Why can't you do that on your site as well so that everyone can create their own DVD's at home? Artwork for DVD covers would be nice too as others used to provide but are hard to find now. I used to be a broadcast professional myself, and frankly this show is every bit as good as the original, with exactly the same high production values. I also perceive that the people that make it are principled and professional. That being the case, it seems crazy to me, that CBS can't find a way to agree distribution rights on the finished series and ths include it in future releases of the original series. After all when all is said and done, it is doing exactly what it said on the tin. It completes the series in the way that it would have been completed, but for an unfortunate error, made back in the 1960's, for which no one can be blamed. Star Trek has survived thanks to fans, not because CBS kept it alive. 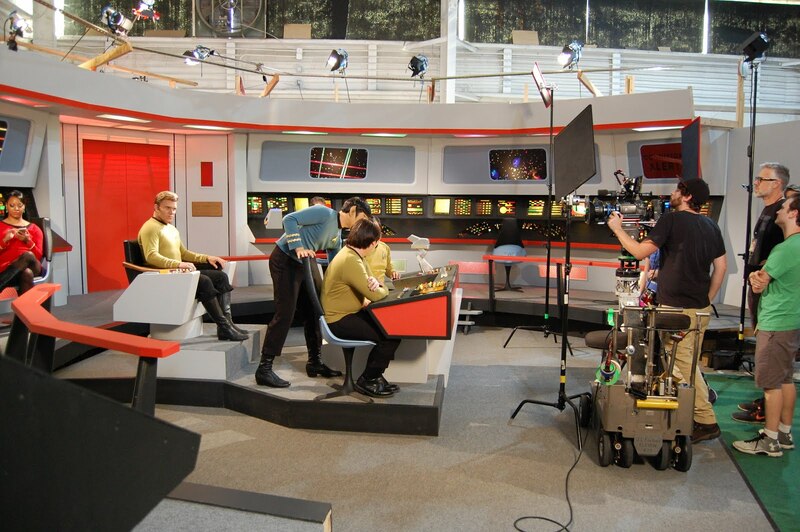 And STC is a huge part of keeping the spirit of Star Trek alive. If CBS is smart, they would pick up STC while having existing episodes untouched and not profiting from them as you have originally intended. I would love to see them make an exception to your series, which of course is not going to happen, but still. While I do not agree with what CBS has done and is attempting to do, I stand by you and will continue to support you. I was blown away by the quality of STC in every angle. I would love to see the original concepts and ideals of Star Trek continue through fan productions; STC certainly does exactly that, and perhaps more. Please keep up the good work. Star Trek opened my eyes to the world beyond what I could see with my eyes when I was little. STC changed my views on fan production and what could happen when the right people put their passions into work. Just wondering why the decision was made to create all new sets when there is a full set in Ticonderoga New York to the exact specifications of the originals? Wouldn't it have saved a lot of productions costs not to have to reinvent the wheel? It's a f***king loss to the arts and the Franchise to break up such a fine team who took up the torch to carry on the spirit of TOS. Appologies for a few typos...typing on my phone. I just discoverd STC and now I amreading it will stop. I really hope somehow there is a way to continue. Any idea when episodes 9, 10 and 11 will be released? Although a professionally produced disk would be preferable, I simply download the episodes into my computer and make the disks myself. I've just discovered STC and what a delight it's been viewing some well crafted and written episodes. It truly reminds me of the 1966 version of TOS. It's truly unfortunate that the show will stop production soon, but that's show business. CBS would be smart to license the use of fan based reboots and publish them on their network as special events around the holiday seasons. That way, everybody wins. I understand their intellectual property rights and one should respect their wishes, but there is opportunity for both fans and corporate since the popularity of this franchise seems to be timeless. Regardless, it was a fun and interesting show to watch and the attention to detail for a fan based boot is impressive would be an understatement. "Let's make sure history never forgets the name: Enterprise!" I would LOVE to tour the sets. I hope you don't dismantle them at the end. Perhaps CBS will read and listen to the fans of STC and pick it up. I'd love to see that. CBS is not doing a very good job on the new show... the costumes look terrible, the ships designs are horrid and don't conform to the timeline. Thanks for all you and your crew have done! It's been wonderful ! ! ! You've got to keep the sets! Surely there are people who want to get married on them, have their bar mitzvah, whatever.... What you've achieved is nothing short of remarkable. Loved Eps 9 and sad to see this series coming to a close. Still hoping for the possibility that Paramount and CBS wise up, realize the hit they have here and let Vic and Co at least release a few feature films before letting everything fade into the twilight. Thanks to the cast and crew for spending so much time and effort to bring us such a wonderful continuation of the TOS adventures. The Star Trek Continues episode "Lolani" is a reminder about the importance of the struggle for freedom. Thank you for that and the other episodes to continue a voyage which helped spark my own imaginaiton as a child. While we have mostly eradicated physical slavery in modern society, there is still a sort-of widespread intellectual slavery. People are enticed into spending time with imagined worlds (like Star Trek TOS) which are controlled for commercial gain. So people's imaginations and related self-expressions are in that sense often commercially controlled. These worlds are kept out of the public domain essentially indefinitely through the threat of lawsuits and criminal prosecution related to broadly-interpreted and continually-lengthened copyrights. According to the Wikipedia page on "Copyright Term Extension Act", the maximum duration of US copyright when Star Trek TOS was created was 56 years. Later changes to the law have extended that duration retroactively. Star Trek TOS would otherwise be shortly in the public domain according to the original bargain in place when Star Trek TOS was created. While people can debate whether copyrights of limited durations are beneficial to our society, breaking past bargains with the public as to when works return to the public domain seems hard to defend. Such retroactive changes to lengthen existing copyrights were unsuccessfully protested in the past (like by Lawrence Lessig in front of the Supreme Court in "Eldred vs. Ashcroft". But the protests failed in part because "Lessig later expressed regret that he based his argument on precedent rather than attempting to demonstrate that the weakening of the public domain would cause harm to the economic health of the country". What if people interested in freeing Star Trek TOS would band together to mount a legal campaign all the way to the Supreme Court (or if that fails, directly lobbying Congress) to overturn those retroactive copyright extensions? A case could be made for the harm done to Star Trek fandom by Paramount's latest fan fiction guidelines which are causing the end of various ongoing production efforts. A healthy society has a good mix of activities including exchange transactions, gift giving, local subsistence production, and democratic planning. Star Trek Continues itself demonstrates what is possible when moving beyond just exchange transactions as a way to organize an economy. Overturning retroactive copyright extensions would return more material to the public domain for use in creating new works to meet current needs through these other types of activities.